The Florida Keys are calling . 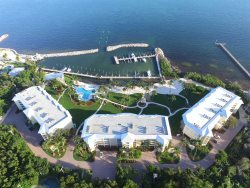 . .
Kawama Yacht Club - A private gated condominium community in the heart of Key Largo. This updated 2 bedroom, 2 bath condo has everything you’ll need to make your vacation a memorable one. This unit features a fully equipped kitchen, large spacious living room, dining for 6 people and a private laundry room for your use. Additionally, there are televisions in each bedroom and the living room, as well as hi-speed internet. The views from the balcony and living room include views of the marina, the ocean, the tennis courts and the surrounding wetlands - the very essence of Florida Keys living. The master bedroom features a queen size bed, a private master bath and ample closet space. The guest bedroom has two full size beds A door from the main living area can be shut, making the guest bedroom a second master suite with it’s own private bath. At Kawama, you’ll find many areas to soak up the sun, either poolside, or around one of the many areas overlooking the ocean. There are trails that meander through the whole complex, winding around lagoons located in the center of the community. Or perhaps you’re looking to spend some time on one of the two lighted tennis courts, just steps away. Kawama is located in Key Largo, and is just minutes from some of the best dining options the Upper Keys has to offer. Key West is only 100 miles away, making for an easy day trip from Key Largo. Contact us today to make your Florida Keys vacation dreams a reality!